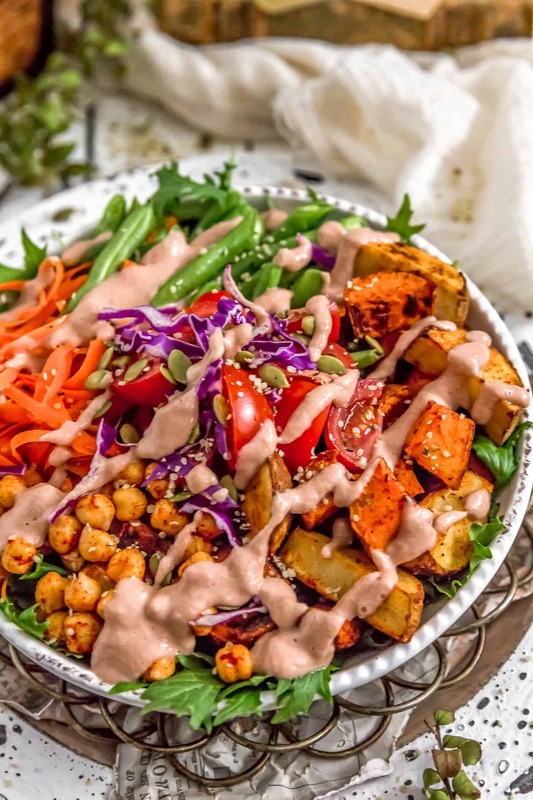 This beautiful salad is life and so much more than meets the eye; it’s absolutely bursting with flavor! 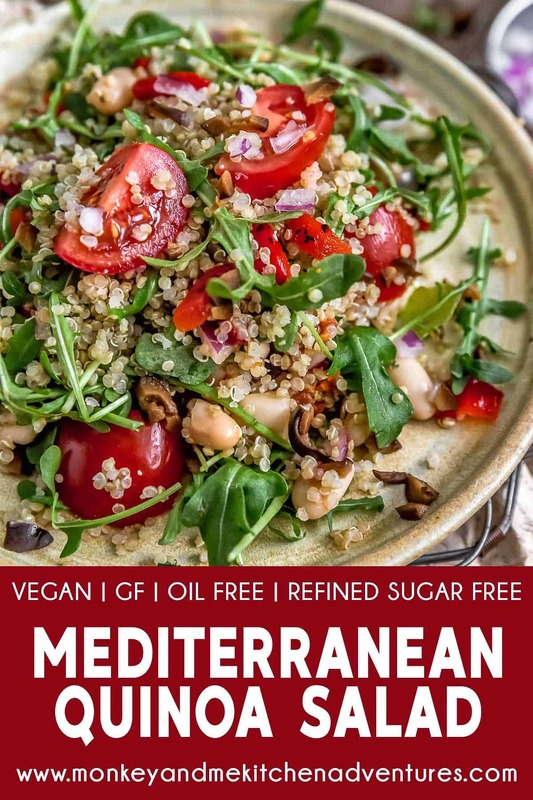 Healthy and utterly delicious, this easy to make Mediterranean Quinoa Salad is filled with nourishing, feel-good ingredients. 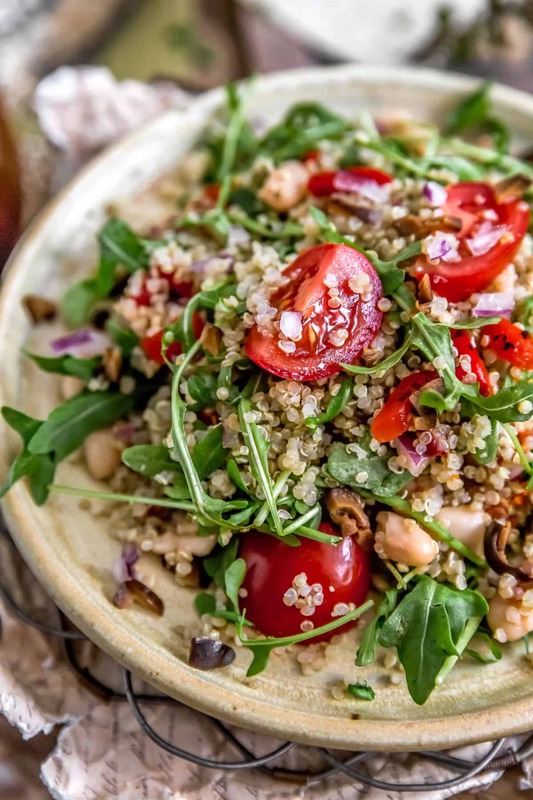 Perfectly fluffy quinoa, hearty cannellini beans, juicy grape tomatoes, peppery baby arugula, tangy Kalamata olives, sweet sundried tomatoes, and flavorful roasted red peppers covered with an irresistible dressing packed with herbs, spices and vinegary goodness. Serve as a filling salad or add as the perfect filling inside your favorite wraps; an excellent meal for lunches and dinners alike! We love a great salad, who doesn’t right? 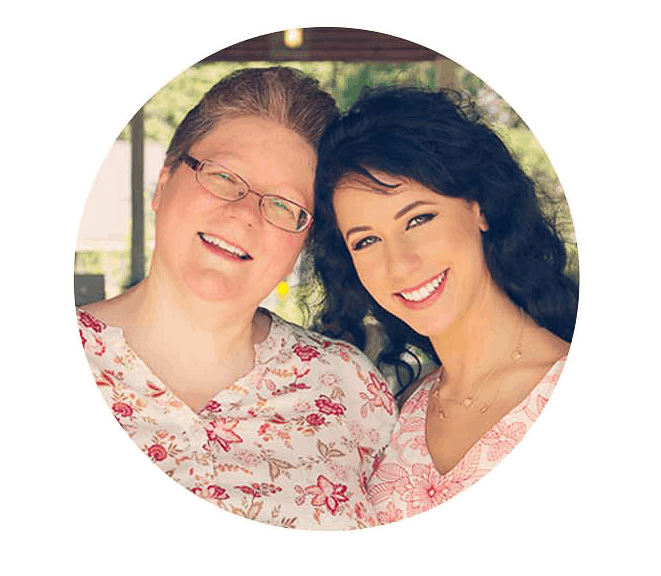 Since we eat a lot of salads in our house, I mean A LOT of SALADS, Mom and I really enjoy creating new salad recipes and tasty dressings. 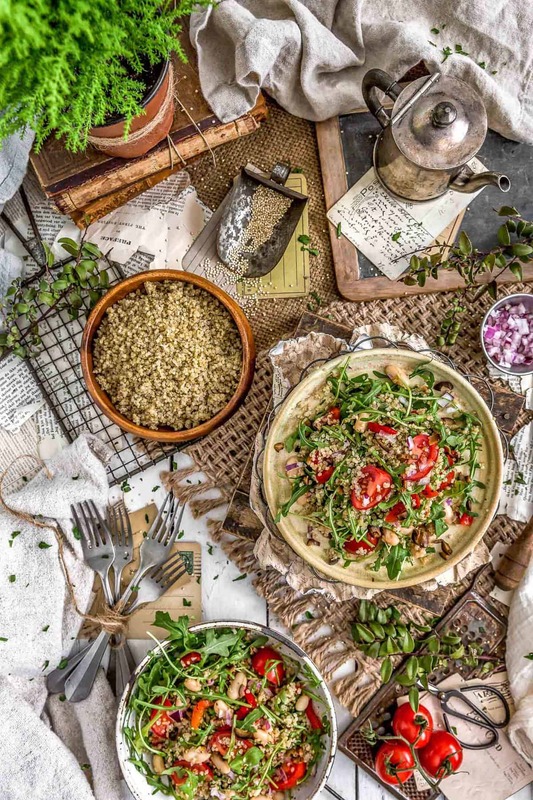 We spend hours and hours discussing greens, veggies, and literally every aspect of salads, trying to create that perfect blend of ingredients, herbs, and spices. 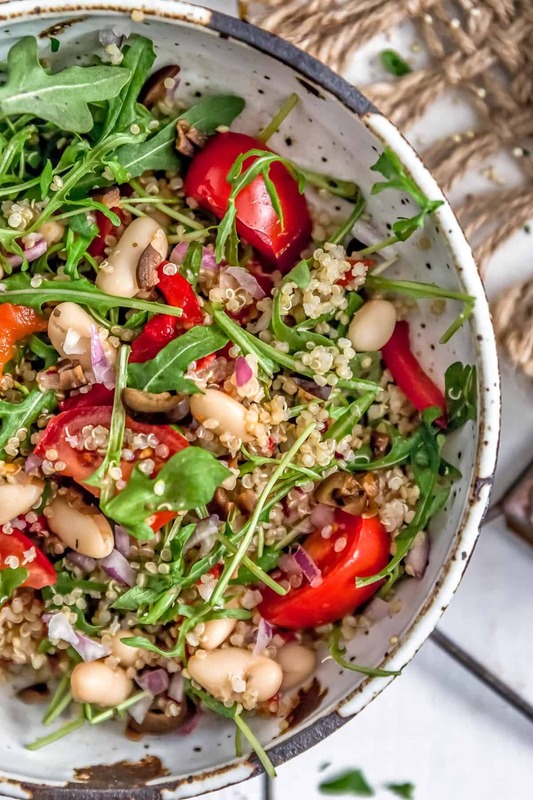 This Mediterranean salad has an impressive list of herbs and spices, but don’t let that deter you from making it. Trust me it is a fabulous salad. We absolutely LOVED it inside of wraps. We used Siete almond wraps as our wrap of choice. It is gluten free and has great flavor, but any WFPB wrap will do. 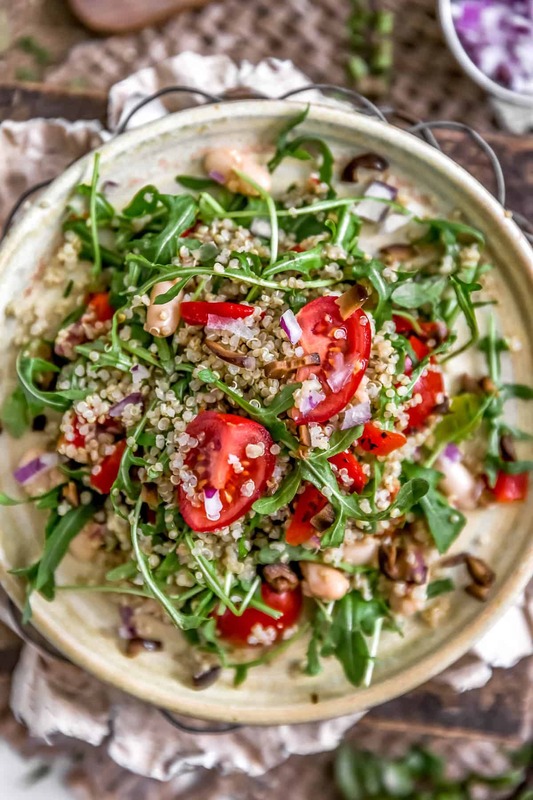 Making perfectly fluffy quinoa is a must to create this beautiful salad. Please check out our recipe on “How to Cook Perfectly Fluffy Quinoa”. Others have told me that they make their quinoa in the instant pot and it comes out great. Either method is fine by us, having a beautifully fluffy quinoa really adds dimension to this salad, soggy, water-logged quinoa just won’t do. When Monkey asked me to taste her kitchen test of this beautiful salad, she had placed it in a wrap for me to try. After one bite, I immediately fell in love and quickly ate another one. We were sitting in front of the TV watching the food channel and scarfing these babies down while toasting our wraps because they were so gosh darn tasty! Monkey nailed the flavor combination perfectly. 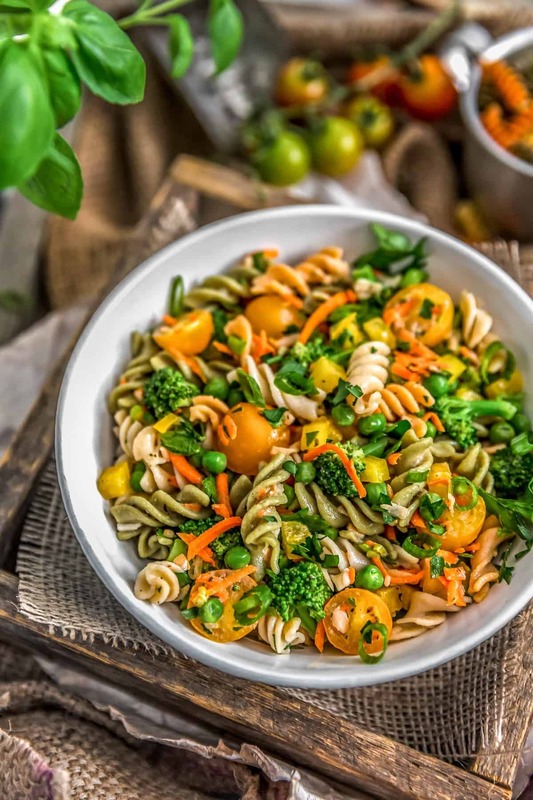 The Kalamata olives are a beautiful accent to this salad, we left it optional, but it just adds this beautiful tangy flavor, that we encourage you to try it. So delicious! Make one recipe of “How to Cook Perfectly Fluffy Quinoa”. Set aside. In the meantime, place 4 sundried tomatoes in a small bowl and cover with boiling water for 10 minutes. Then drain off the water and chop into small pieces. 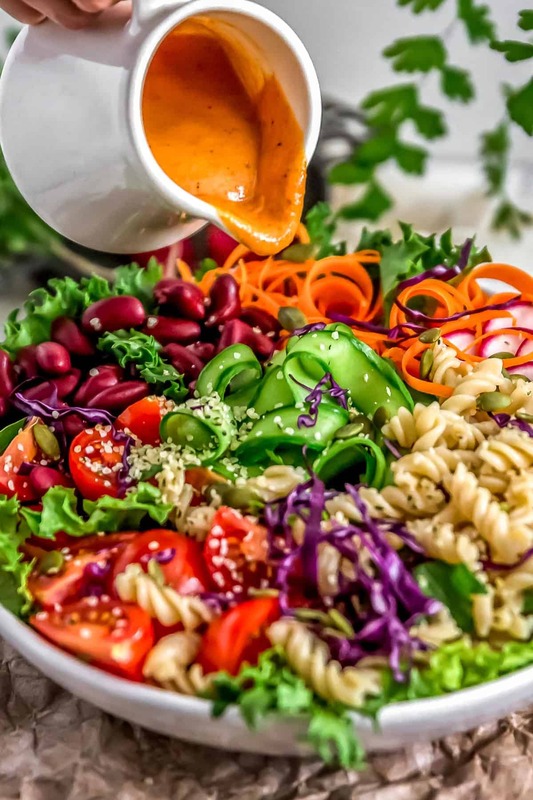 Make the salad dressing (include the finely diced red onion, chopped sundried tomatoes and chopped Kalamata olives) by adding all the salad dressing ingredients into a bowl and whisking until well combined. The dressing will seem thick because of the chopped red onion, sundried tomatoes, and olives, but that is fine. Set aside. 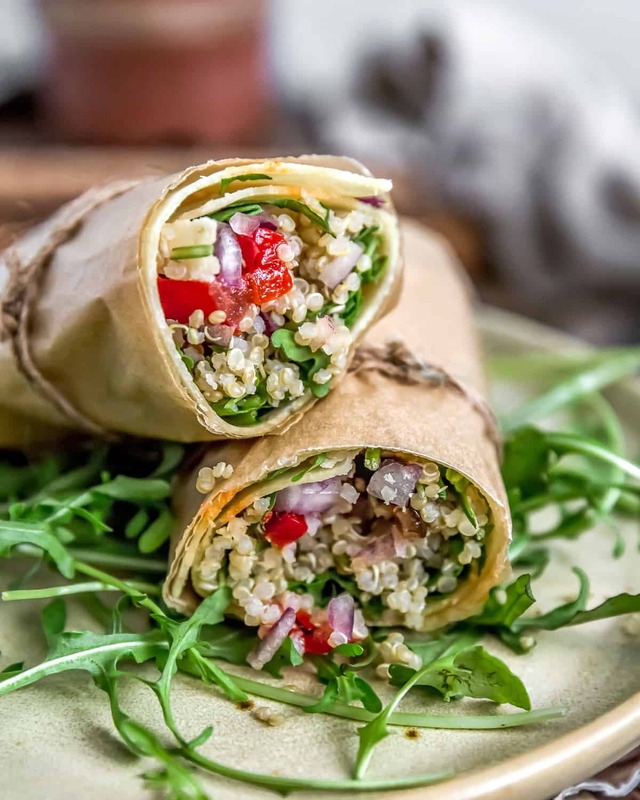 Place the cooked quinoa, and all the remaining ingredients into a large bowl and then add in the salad dressing, tossing gently until everything is coated in the dressing. *Roasted Sweet Peppers: We used Mancini Roasted Sweet Peppers. They are beautifully sweet, Whole Food Plant Based compliant, and have excellent flavor; however, you can roast your own peppers if you like. Place the oven rack near the top and set the oven to high broil. Place one large (or two small) red bell pepper on a baking sheet and broil on high, turning occasionally until the pepper is soft and the skins are dark (black). This takes about 10-15 minutes (or longer depending on the size of the peppers). Immediately place the pepper in a glass container and cover with plastic wrap or a tight-fitting lid to sweat the pepper. This helps with removing the skins and seeds. Set aside for 10 minutes to cool. take the cooled pepper and pull the stem off and discard; then tear open one side of the pepper and scoop out the seeds (discard), then lay the pepper out flat, charred skin side up, then pull and scrape off the charred skins and discard. Then cut into thin strips. *Red Onion: Placing the red onion directly in the dressing allows the red onion to marinate and it also removes any sharpness that the red onion may have. This is optional, but we really enjoy how mellow and sweet the red onion becomes. *Sundried Tomatoes: We used Mediterranean Organic Sundried Roman Tomatoes. Be sure to select oil free sundried tomatoes. They are typically dried like dates.